I don't want you to think I've fallen off the face of the Earth, or that I'm off getting drunk or something. My sleep schedule has gotten upended in recent weeks, with me sleeping mostly at night - what a concept! That has resulted in me posting in the morning, which historically I almost never did except at the end of a long night of working on the entry. But last night I was up all night wrangling HTML for the St. Michael and All Angels web site, and I had to sleep before doing anything else. This entry is a placeholder for the moment. I've got to go buy groceries, but I didn't want to delay posting any longer. Trust me; there's a long rant ahead about HTML and CSS, GoDaddy and SeaMonkey, and the problems in updating web pages first written over a decade ago. I'll also share the stuff that seems to be working, and the sage advice I've been getting from Julie and John, which I may act upon eventually. So stop back. It'll be fun. Many hours later: am I having fun yet? I pretty much spent the day fussing with the St. Michael's site some more, with way more expert assistance from Julie B than anyone could reasonably expect. Every one of the main pages now has a cool individualized header similar to the one at the top of this entry, and color coordinated links at the bottom, and much less text that looks tiny because of a difference of opinion between GoDaddy (which likes span tags) and SeaMonkey (which likes font tags). Thanks to Julie, some of the pages are now linked to a style sheet that simplifies the formatting a bit, but I still have much work ahead of me streamlining everything. If being a geek is defined as technological competence, then today has been a blow to my geek standing. I really, really don't understand css well at all. But I'll learn. I will! 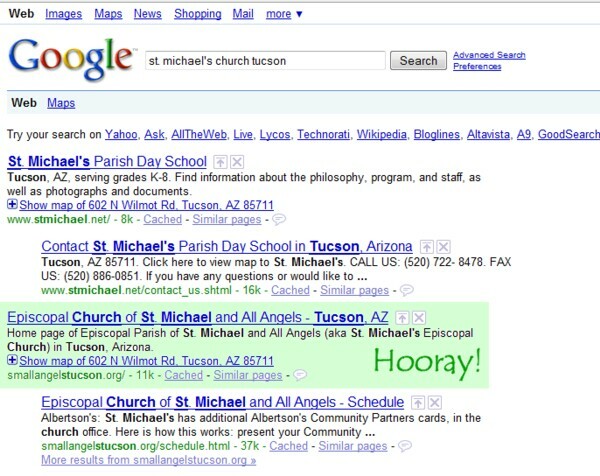 We're third now on the first page, right behind two links for St. Michael's Parish Day School, which is in the same building complex as the church and shares close ties in many ways. Fair enough: they have a bunch of links to sites about schools, and have had a considerable web presence much longer than the church itself. I've been the church webmaster exactly five years, and frankly I coasted along on static pages (read: stale and unchanging) for much of that time. But now the pages are bright and new, with nicer graphics and somewhat better coding. Some of them even have dynamic content, after a fashion. The Community page now has two slideshows, fed from the same Picasa albums that store graphics for the church's news and arts blogs. As I upload more photos, they'll be in the slideshows as well. The main Sermons page has a widget showing the most recent entries on the Sermons podcast blog, to which Father Smith will upload more sermons any year now. And the home page and schedule page both feature a widget for recent entries on the news blog. Next I'm hoping to find a widget for the Seasons page that can tell you which liturgical season it is right now, and maybe even how such things are calculated. So the year ends on a slight up note. I don't have a job, but at least I managed to accomplish something as the parish webmaster. What are you supposed to do with the other 11 days of Christmas? I know, I know. For many people, the only way you know there was ever more than one day of Christmas is from that song with the partridge in a pear tree. For you, Christmas ends with the first serving of turkey or ham, or with the opening of the day's last gift on December 25th. Father Smith at St. Michael's mentioned in his Christmas sermon this year that early in his priesthood he once saw a discarded Christmas tree with tinsel and a few broken ornaments by a dumpster, at 9 AM on Christmas morning. I'm guessing that was a corporate tree, an office tree. Or maybe it was the tree of some divorced parent whose visitation ended with Christmas Eve, and did not want the reminder of a Christmas without the kid lingering in a lonely apartment. In the retail and secular world, it's the run up to Christmas that matters, the shopping and the music, the decorating and the anticipation. Once the gifts are unwrapped and the food is eaten and the in-laws go home, Christmas is over. Time to take the tree down, put the Christmas music away, and figure out how to use up the rest of the turkey. So much for my take on Advent. But what comes next on the Church calendar? That would be Christmas. The observance starts the evening before, and runs through the Feast of the Holy Name (January 1, commemorating the christening of Jesus) and into Epiphany (January 6, commemorating the arrival of the Magi). The liturgical focus is on Jesus being revealed to the world - through the angels and the shepherds, those astrologers from the East (whose number is not given in the Bible, and who probably weren't kings), the people at the christening and John and Yahweh on the banks of the Jordan. So what am I supposed to do about it? 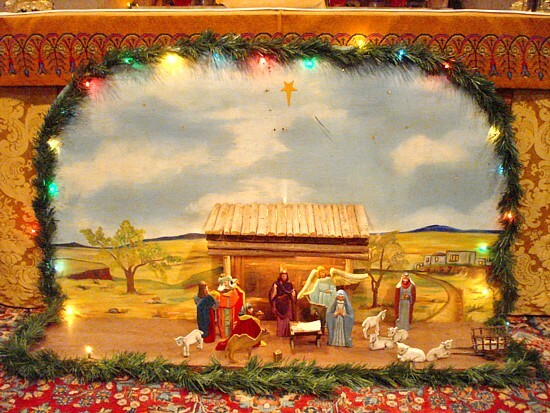 In Western culture, you can't completely avoid the story of the birth of Jesus. It's become a stale cliche, and you certainly don't need me to tell you about it. The best I can hope for is to touch lightly on the subject here, and hope I'm not being too annoying. And while I'm doing that, what else should I be up to? At the moment, the mundane part of these additional days of Christmas involve using up the turkey and washing an endless supply of self-regenerating dirty dishes. There's also the ceremonial using of the gift cards and the purchase of additional gifts were missed in our too-limited Christmas frugality. Gift cards from my godson's family and my friend Kevin got me most of the way to DVDs of Doctor Who: The Infinite Quest and Prince Caspian with all the extras, and I got John the calendars he needs for home and work, at the post-Christmas half-off price. Incidentally, my local Barnes and Noble completely let me down on books from my Amazon wishlist: no Scalzi hardcovers, no recent McCaffrey Pern book, no James Burke at all, no Doctor Who books of any sort, no Patricia C. Wrede I didn't already have, no copies of L'Engle's last book (which I ordered online from another gift certificate) or the audio edition thereof. It's getting to where Amazon is the only place to get anything but current bestsellers or royalty-free classics. What does popular culture say this time is for? One goes back to the office, right? But I can't do that. Yesterday I turned down my most pathetic lead yet, for a strictly temp job in a position (Accounts Payable) ranked below anything I've done recently, for less money than I was making before I had an accounting degree. And of course I felt guilty about it, but I've got to believe that something better will come along, not necessarily at the level I'm used to or better, but certainly better than that. It's also time to make close-of-tax-year donations (we need to get the old cars hauled away - but then, we say that every year) look back upon the year that's ending (I'm already depressed enough, thanks) and start thinking about New Year's resolutions. I guess for me, it's time to crack open the accounting books that just arrived UPS, and sign up for one of the online seminars I recently paid for. Jesus is here and Jesus is coming, maybe, and I don't know whether I have one day to live or another fifty. I'd better get moving, preparing for the possibilities. For Ellipsis Monday Photo Shoot #18: Watching The Clock, Carly (naturally enough wants to see some clocks. 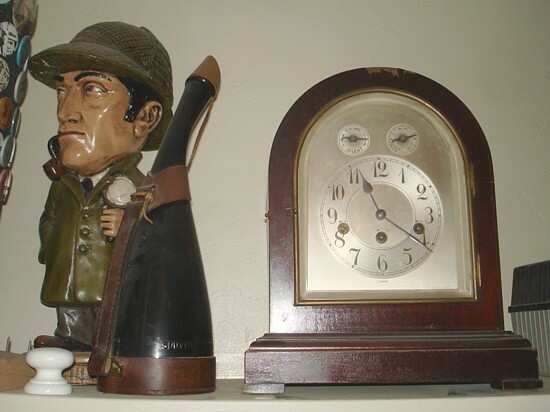 I think I've shown off all our clocks in this blog at one time or another, except maybe for the old nonfunctioning mantle clock, and I don't know where that is. But here we go anyway. Wait a sec - could the mantle clock be in the library closet? It is! His grandfather's clock's not too tall for the shelf. Not exactly in a place of honor, is it? But at least it's survived our many purges of old stuff. This belonged to John's grandfather. I don't think there's any more to the story than that. It's a little banged up, and I doubt that it's in working order. But the main reason it's in a closet, aside from the fact that display space is at a premium here at the Museum of the Weird, is that it doesn't fit the MotW's midcentury modern aesthetic. 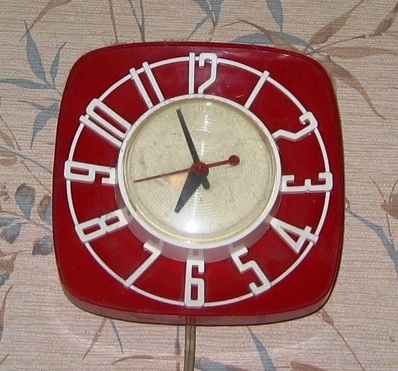 A 2005 photo of a vintage modern clock, never to run again. Now here's a clock that suits John's enjoyment of all things retro moderne. Probably close to 50 years old, it's an eBay purchase from nearly a decade ago. Unfortunately it needs a new motor, which is unlikely to happen. But John likes the bright red plastic and the updated art deco look of it, and so this, too, has survived purging. 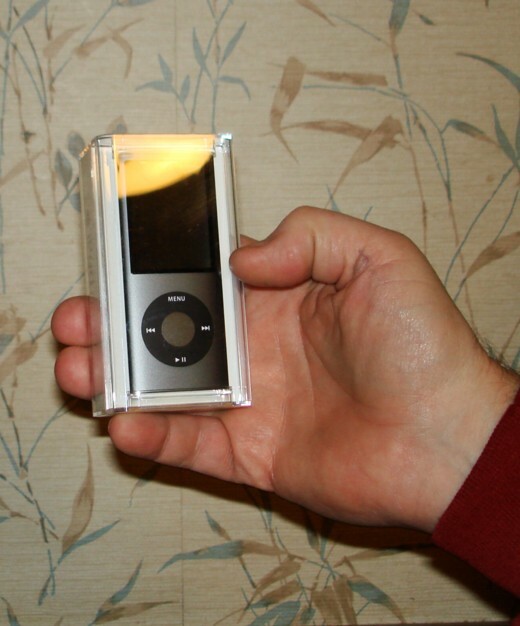 Just last night John pulled it out of a box, thought about whether to keep it, and put it back in the box. My clock radio celebrates a radio station that's long gone. This next clock doesn't approach the age of the first two, but it dates back to the 1990s, which is impressive enough for a clock radio. I don't know about your experience in this area, but I find that the alarms on clock radios tend to stop working properly after a few years. This one still wakes me up, though, when I need such things. The stickers on it are for Cool 92.9, the oldies station where I once knew most of the disk jockeys personally, and contributed song lists for their My Three Songs and Top Five at Five features. Then my friend Rich "Brother" Robbin was canned by the soulless corporate overlords, and within a year the station was essentially gone, with no live disc jockeys and a nonsensical and unlistenable playlist. Cool and its oldies later came back on a low power AM frequency, but I couldn't get that on my radio and anyway, the magic was gone. 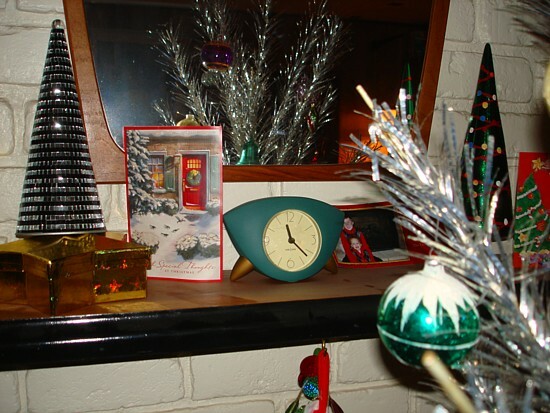 Retaining a place of honor among the Christmas decorations is this modern teal green clock John bought in the Netherlands nearly a decade ago. (I'm pretty sure it was made in Denmark, though, making it Danish modern.) 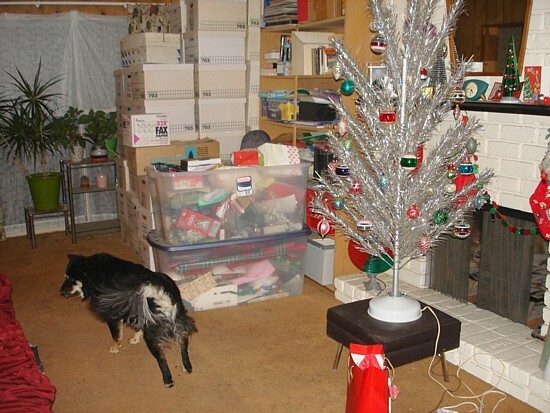 I've photographed it before, repeatedly, but not usually with such festive surroundings! John's non-vintage but modern alarm clock. 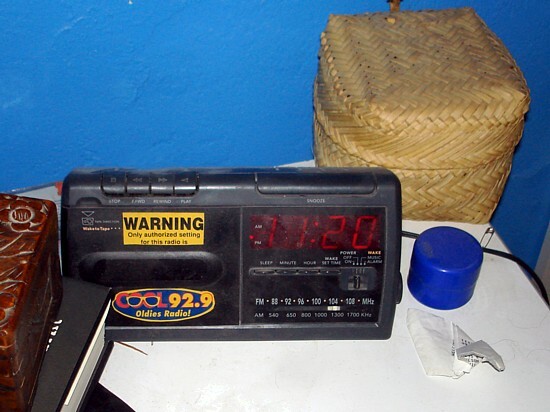 Here is John's current alarm clock. 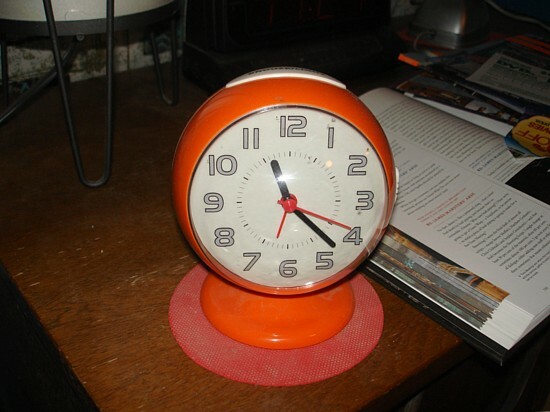 It's from Target, I think, but he also has a vintage ball clock somewhere that doesn't work as reliably. I've never managed to figure out how to turn this clock's alarm off, which can be a problem if I'm in bed and he gets up before the alarm. My Rumor, with two alerts from some Facebook malarkey. 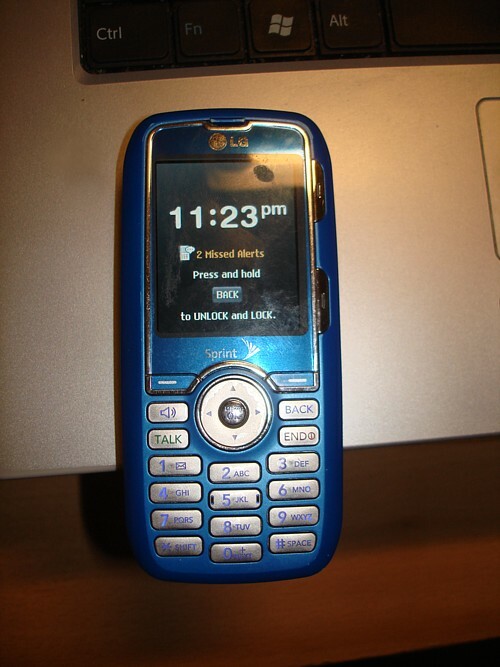 Finally, here's the clock I actually use the most: my LG Rumor phone. I got this over the summer. The missed alerts on it were from a Facebook quiz thing. It was trying to sell me some texting game, so I deleted the alerts. The last time I sent and received texts, my cell bill doubled. Carly also asks for a photo of a clock showing our favorite time of day. I'm not sure I have one right now. It's no secret I'm a night person, and historically I've gotten in most of my computer time between 9 PM and 5 AM. But since my becoming unemployed, my sleep schedule has become even more screwed up, if that's possible. I've been sleeping part of the night, blogging, and then going back to bed at midmorning. Go figure! Be sure to check Carly's blog Ellipsis every Monday for the week's EMPS assignment, along with links to the previous week's entries. And while you're at it, how about joining in? 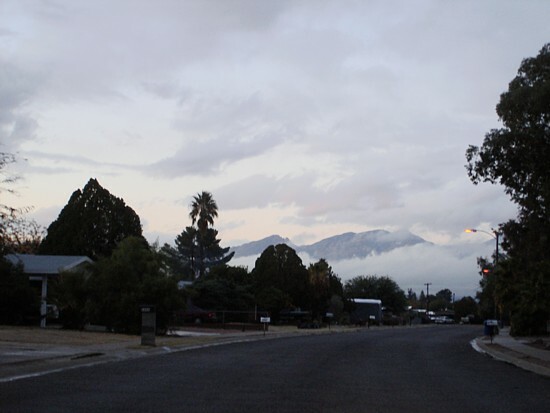 Once in a great while, the skies over Tucson prove themselves capable of producing proper winter weather - "Syracuse weather," I like to call it. Although my adopted home will never be able to compete with the low temperatures of Minnesota in winter, or Syracuse at its coldest, it nevertheless gets down below freezing sometimes, and even the days can be rather cold and miserable. The past several days have marked one of those occasions, and I have the pictures to prove it! 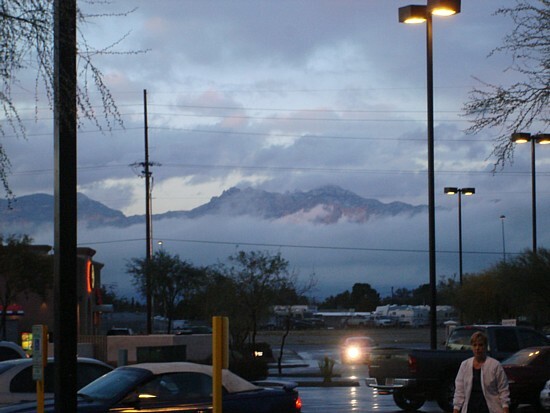 Clouds on the Santa Catalinas, December 26, 2008. 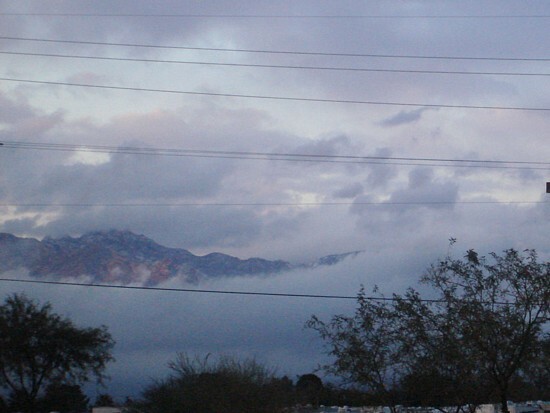 Almost the only bit of the Catalina Mountains visible at that moment. The view from Calle Mumble. 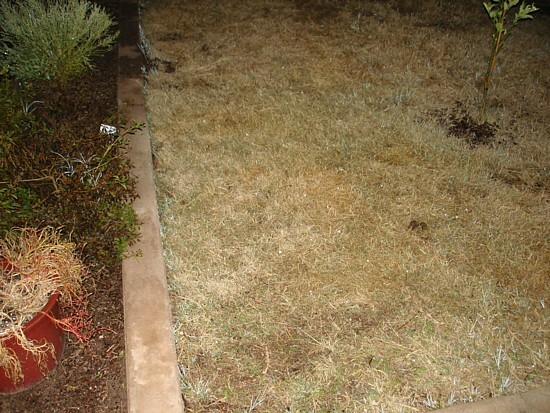 But still no snow on the almost-frozen ground. 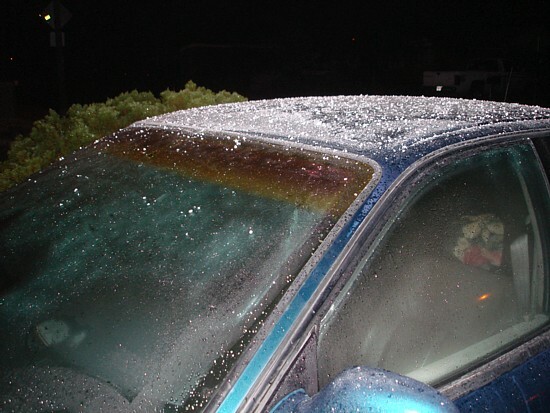 Much defrosting was needed before I could drive to Barnes & Noble. 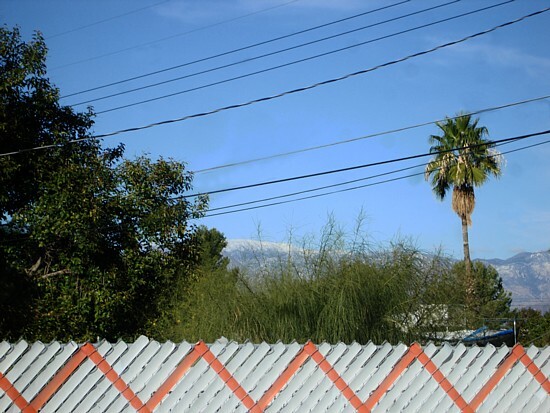 The next day: snow on the mountains. None in the city. 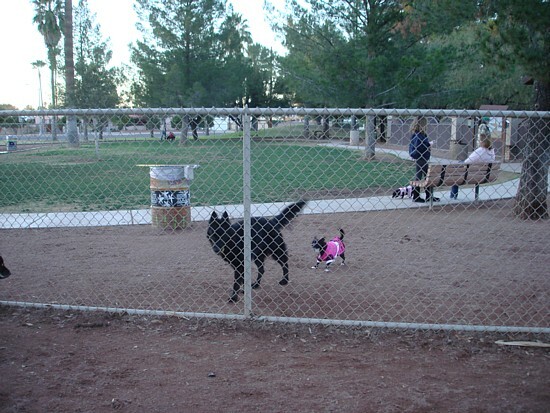 At the dog park Saturday, a few smaller dogs were dressed for the weather. We weren't able to get to the dog park at all on Christmas or the 26th. On Boxing Day it was raining much of the day, and the cold and mud of Christmas Eve at the dog park had been bad enough even without the ongoing precipitation. But on Saturday the 27th the dogs and I went anyway. The temperature was in the low 40s, and much of the dog park was flooded due to the drinking fountain on the closed off side spouting like another kind of fountain, probably for hours. None of the handful of large dogs present were put off by or dressed for the cold and wet, but a few dogs on the small dog side were sensibly covered up. This doesn't normally happen much around here. I've been busy the last 24 hours moving files around between three hard drives, trying to get rid of a corrupted backup from 2007, back up my files properly for the first time in over a year and move unedited photos onto my external drives to free up the internal one a bit. This took up pretty much all of my computer's processing power for hours and hours, so I haven't been able to make the rounds on recent meme participants (EMPS, Feline & Furball Friday and Round Robin). I'll get there soon, I promise! P.S. I just got out of bed to turn the thermostat up to 66 degrees. It's Round Robin time again, and this week we're doing "Favorite Toy" as the topic. Hey! That's one of mine! Now, what did I have in mind when I first suggested it? I've no idea. I do, however, have some toys to show you. After photographing some of them, I realized that several were hero-related. So that's my hook for this entry: heroic toys. 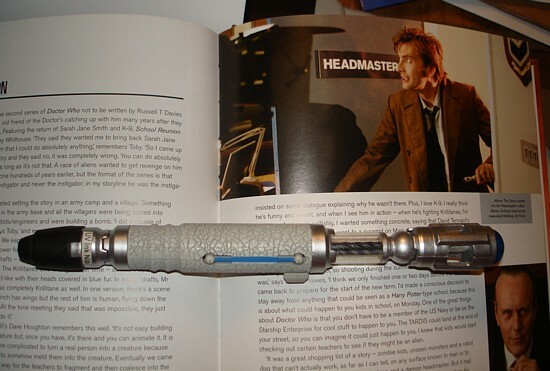 My sonic screwdriver, and the Doctor's. First off, here's my actual current favorite toy. I've had it for a year or so, and it's still on my desk, in case I should need at at any moment. 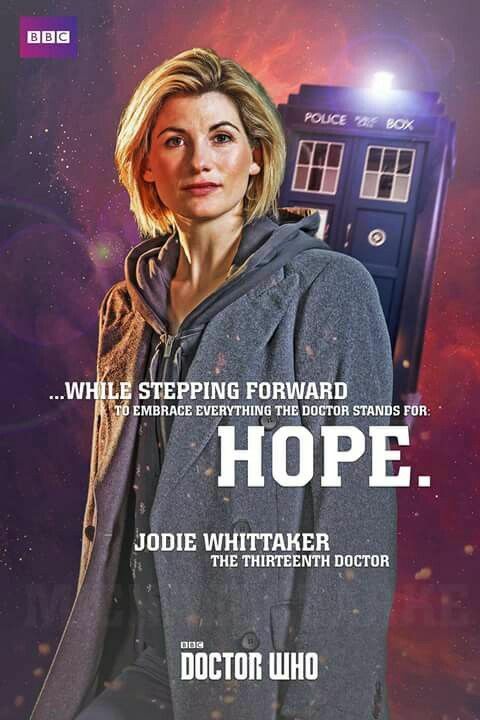 The "real" one on Doctor Who can unlock doors, light candles, repair barbed wire, increase the power of various devices and do lots of other marvelous but unlikely things. But what does mine do? 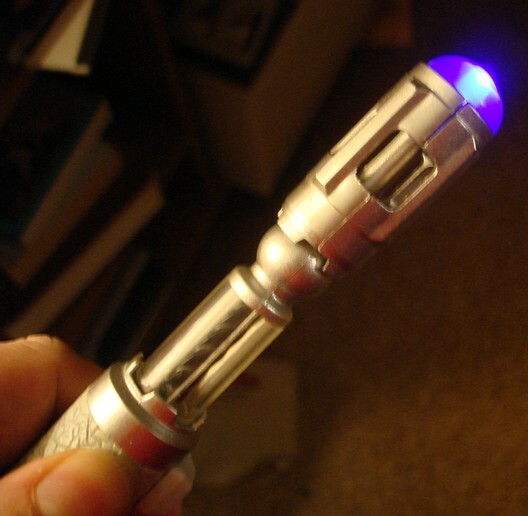 The sonic screwdriver in action! Taa-dah! It lights up! It makes two different, entirely canonical noises! Also, there's a UV pen nib buried under the tip at one end. This can be used to write messages on the second toy that comes with it, the psychic paper. The latter is a piece of white plastic in a leather wallet, a replica of the Doctor's all purpose flimflam for showing people invitations, fake ID or whatever else he wants them to see. Shine the sonic on the message you wrote, and the writing appears, much like the messages the Doctor occasionally receives on his psychic paper. Hooray! As much as I go on about Doctor Who and its heroic title character, the Doctor, one might think he's my only fictional hero. Au contraire! There's also Sam Beckett, and Sherlock Holmes, and Zorro. Zorro? Si! El Zorro! And here he is! The bold renegade, El Zorro! Now, I do like George Hamilton's Zorro, The Gay Blade, but for me the definitive Zorro will always be Guy Williams from the 1957-1959 Disney tv series (plus a few stories on The Wonderful World of Color through 1961). Guy's Diego de la Vega and black-masked alter ego add up to one great character: clever, brave and principled. I love the way Diego can think and talk his way out of almost any situation, even as Zorro does all the swashbuckling stuff. 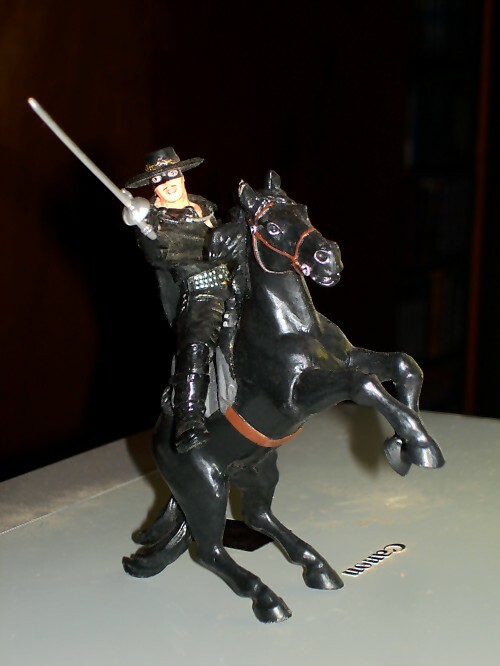 I have had my toy Zorro with me at work through my jobs with First Magnus and Beaudry, a reminder of the value of ethics, cleverness, and having the courage to fight for what you believe in. I haven't had occasion to battle injustice as an accountant, but I'd like to think that my little plastic hero would stand with me, encouraging me to do the right thing. 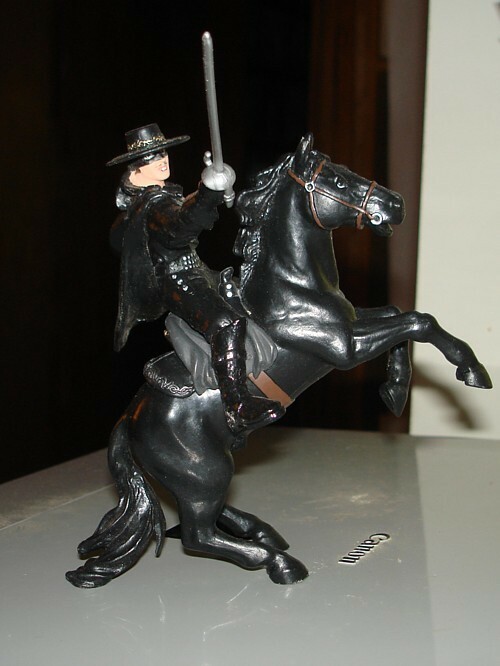 Zorro and his horse Tornado. 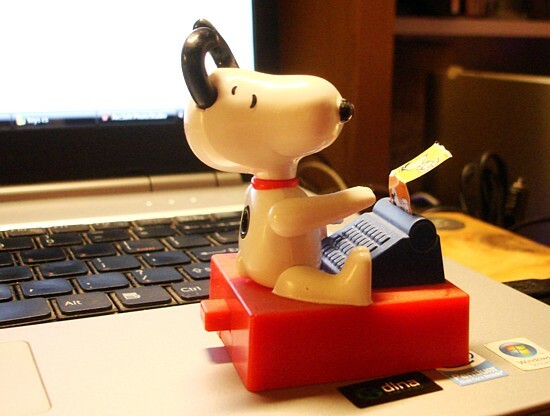 Snoopy, still writing about that dark and stormy night. I have a few things in common with Snoopy. I live in my head a lot, not so much becoming a flying ace and other heroic figures as imagining the lives of heroes and writing down some of their adventures. (I actually need to do much more of this.) And like Snoopy, I have unsold novels, with a daunting number of rejections but a need to keep trying. Now let's go see everyone else's favorite toys! And remember, you're welcome to join in, too, even if you're a day or two late. See the Round Robin Photo Challenges blog for details! Weekend Assignment #248: What'dja Get? 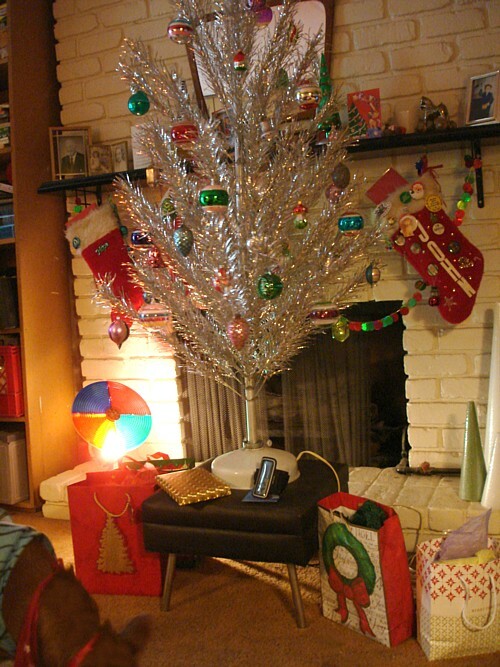 Weekend Assignment #248: What was the most interesting or unexpected gift you received this holiday season? 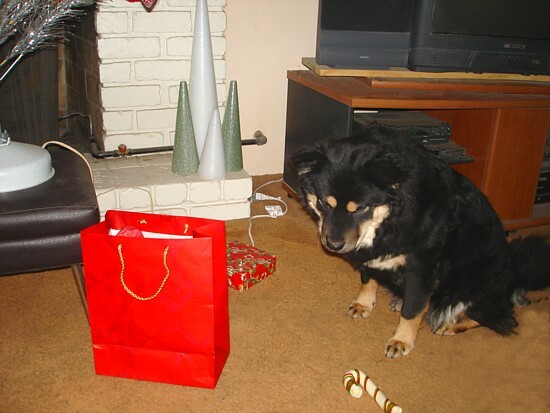 Extra Credit: What was the most interesting gift you gave this holiday season? Here's mine. It wasn't the biggest gift (that was the check from my Dad), but it was certainly the most unexpected one. 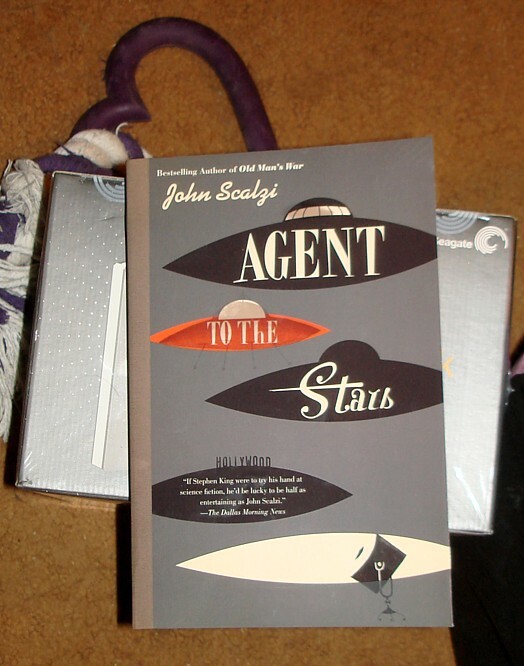 One of the Weekend Assignment regulars, my friend Julie, sent me the 2008 Tor edition of John Scalzi's first book, Agent to the Stars. I've wanted the book for years, ever since reading about the original online version on By the Way and Whatever. I should have ordered the limited edition from Subterranean Press when it came out, but ah, well. I expect money was tight that year, too. I love the cover on the Tor edition, by the way; it's deliciously retro. Thanks, Julie! You brightened my sparse Christmas considerably. ...except for the law of unintended consequences. 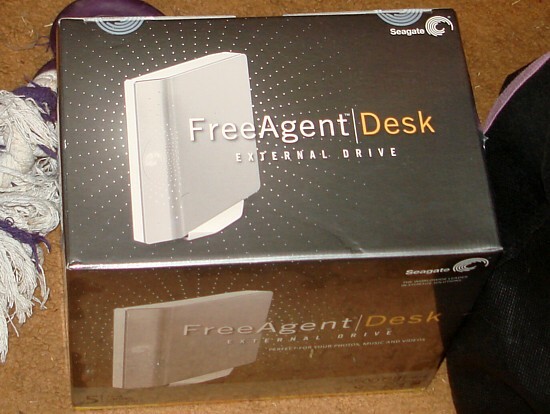 When we went out to Target on December 23rd for the iPod, I wanted to look at external hard drives. John told me not to, and that was enough to tell me what my main non-cash gift this year was. It's no less appreciated, but it's always better when we don't know that it's coming. My most interesting gift to someone else hardly counts as a gift at all. 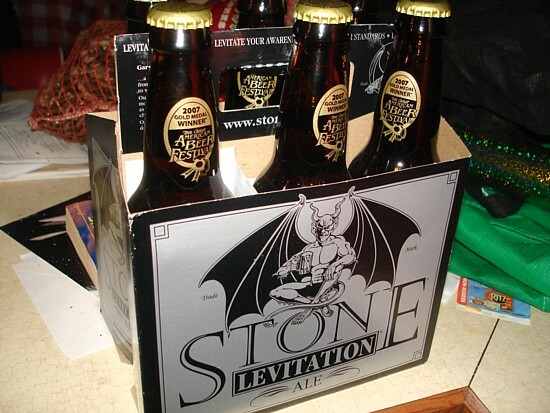 On Christmas Eve one of my last Christmas shopping stops was at Traders Joe's, where I picked up this very gothic fantasy/SCA packaged Stone Levitation Ale for John. He likes to sample a variety of microbrews, but would probably not have chosen one that was quite this silly-looking. I got it anyway because the label notes that it was a Gold Medal Award winner at the Great American Beer Festival. And it turns out that the reviews for it are quite good. I have to admit that Paul and I now enjoy spending Christmas day at home. Back in the B.C. (Before Chris) era, I worked in retail and then in radio, which meant very odd hours. I did get Christmas off in retail, but I volunteered to work Christmas at the radio station (sometimes double shifts) because we didn't have any kids. Once we had a child of our own we decided that we would at least spend Christmas mornings at home. Apparently, there's no place like OUR home for the holidays this year. Christmas is here for the first time since...wait...this is the first time EVER. I had Thanksgiving here one year shortly after we moved in and that was the last time. Hmm. Maybe my cooking isn't as good as I think it is. Back to cleaning up the house in my usual insane panic mode. It seems that for much of my adult life, the holidays have involved travel for someone close to me, although more often than not, the person or people in question have traveled to me and my home, even if that wasn't really "home" for them. That's it for now! I don't expect a big turnout this week, but I'll be thrilled if you can work in a Weekend Assignment in the midst of your inter-holiday activities. Write about the assignment topic in your blog or journal, and include a link back here. Then leave a link to your entry in the comments below. Please don't forget your links! I'll be back in a week to highlight the results. A reminder: I'm still running low on ideas here, so I still need your input. What would you like to see as a Weekend Assignment topic? Email me your suggestions (mavarin at aol.com). If I use your topic you'll get full credit and my undying thanks. 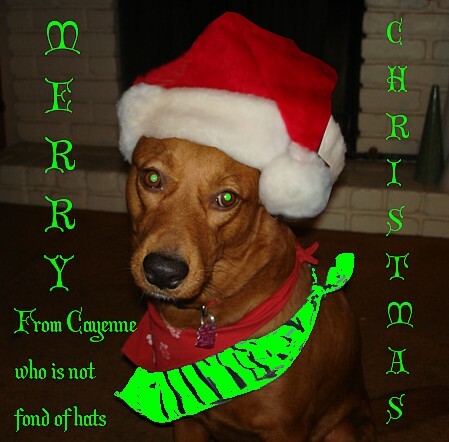 The rawhide candy canes were a mistake. After all the extensive dog (and cat!) blogging I've done in the past week, I was hoping for some nice Christmas Day photos for Feline and Furball Friday, of Cayenne and Pepper interacting with decorations and presents. 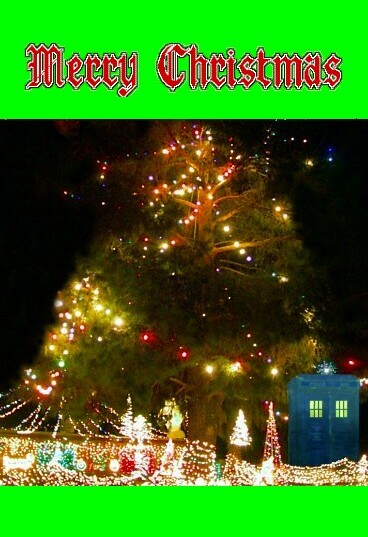 It didn't happen, partly because I was busy with other Christmas activities (imagine that! 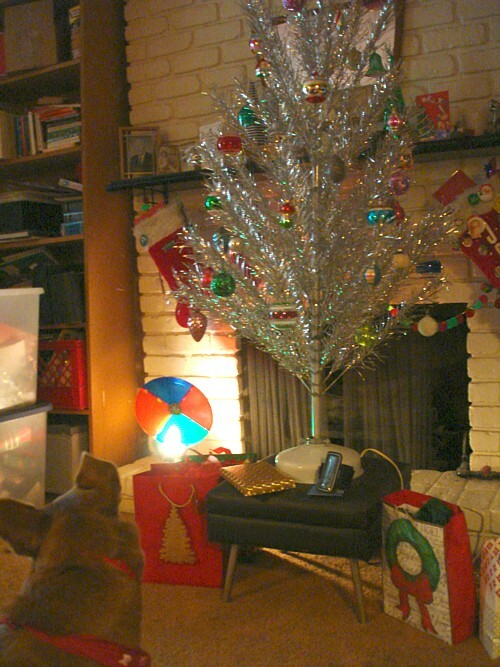 ), but mostly because the dogs don't like the aluminum tree when the motors on the stand and color wheel are running. Pepper didn't want to come into the den at all on Christmas Day, and spent much of the day on the bed with one of the rawhide candy canes. 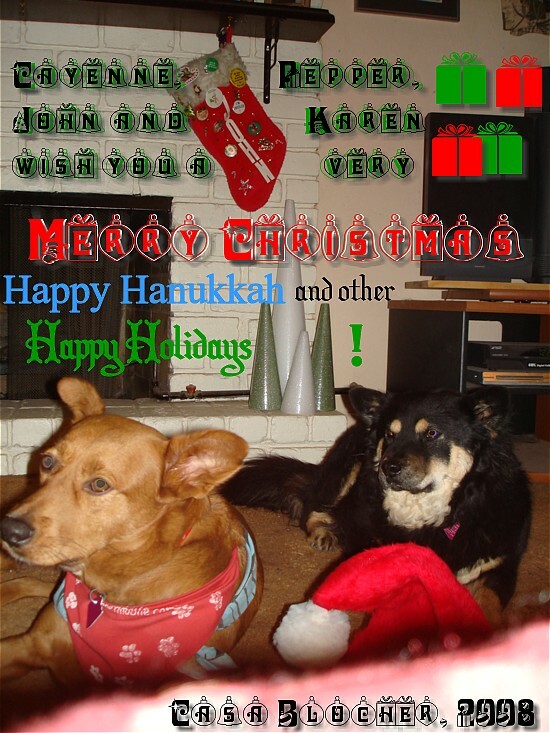 As I say, they were not a successful gift for the dogs. Neither one wanted to actually chew on the things, but they both were determined to keep track of them, lest the other dog take possession. 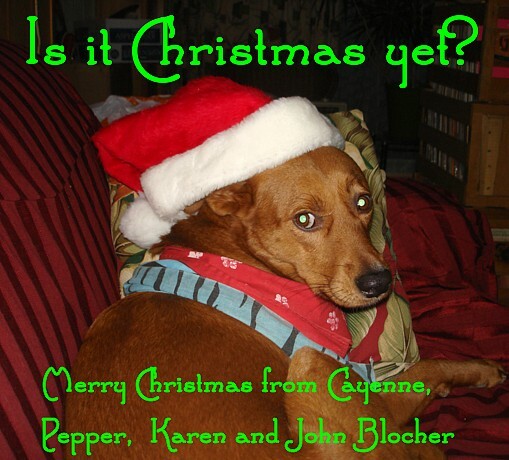 John was convinced that one of the reasons Pepper stayed out of the den was that Cayenne had one of the candy canes on the floor near the entrance to the den, and was intimidating Pepper any time she approached. John eventually took away the candy cane, and it seemed to help - except that Cayenne was interested in the shelf where the candy cane was, and I worried about her jumping or climbing to get the useless thing back. 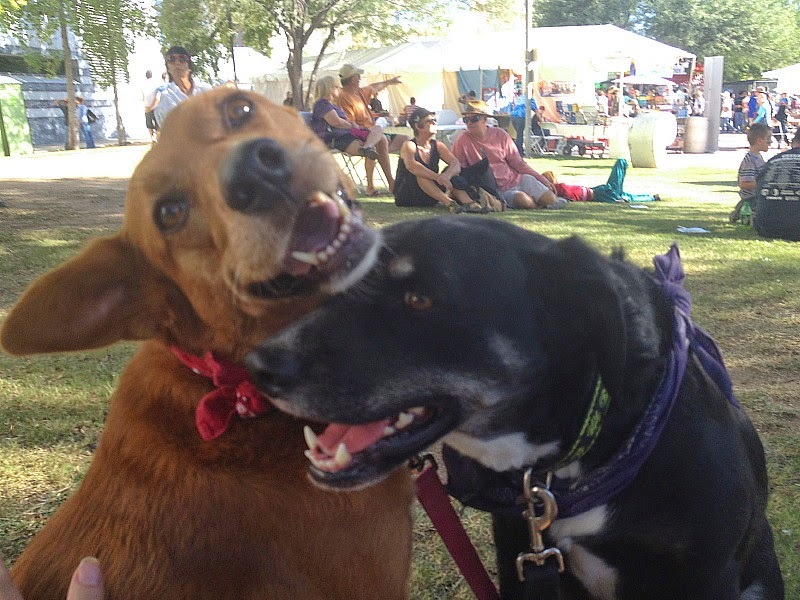 Be sure to check (sometimes)photoblog every Friday for links to the week's cat and dog photos. And just this once, here's a F&FF cat photo from me, left over from my trip to the Hermitage Cat Shelter last week, which was a highlight of my Christmas. (Uploading this and four other photos this morning also increases the number of photos in the slideshow in the previous Hermitage entry.) As you probably know, I'm very allergic to cats, but I managed to photograph a number of them with a wall of glass between me and the dander. Enjoy! The Weekend Assignment entry will be up in a couple of hours. Probably. Merry Christmas! I probably shouldn't worry about getting into the Christmas spirit, because I usually get there eventually. This year it didn't come from shopping, or reading the Bible, from certain Christmas songs or a Christmas tree or looking at lights. This year it was about people, and little ways the holidays help to connect us to each other as well as our better selves. I already told you the story of the cat adoption on Monday. My friend's cat had just died, and it was a disaster for her because she's disabled and basically alone in the world. I took her to a no-kill shelter where she got herself another cat. It cost me nothing but a little gas and my time in order to make a difference in the life of someone who really needed it. Today I did a lot of running around in a vain attempt to find cranberry orange relish and pfferneuse, and to get stuff to fill John's and the dogs' stockings. At 4:15 I found myself one traffic light away from Eva's senior facility, with 45 minutes to get her to the Christmas Eve Family Mass at St. Michael's. The dogs were still in the car from the dog park, but it made more sense to pick her up and then drop them off than the other way around. It ended up taking a long time, because she had moved into their assisted living wing, and I had to get there, and arrange to pick her up at the back of the building. I tried to pick her up at one end of the corridor, but she had gone out the other, so I had to track her down. We ended up about five minutes late to church. The Family Mass was full, so we couldn't see the kids helping Father John set up the creche at the altar. He had the congregation sing quite a few familiar carols and one that I didn't know at all, and sent the children through the church to tell the secret he had whispered to them: "Jesus is here!" He asked for volunteers to run the collection baskets down the aisle, so I volunteered - one more little task to add to my St. Michael's repertoire. Eva wasn't up for a long communion line from the back of the church, so Father Smith brought it to her. Afterwards I took Eva for a drive to see a few displays of Christmas lights in my neighborhood, including the one with the Big Tree that I've been posting photos of for the last week or two. Tonight I took a few more photos, a little more close up to catch details. Then I took Eva home, and did a little last minute shopping. The big find: alcohol-free fruitcake, deceptively called "Fruit and Nute Dessert Cake." Presumably they're aware that basically the whole country has been socialized to believe that fruitcake is inedible. No wonder Walgreen's and pretty much everyone else stopped carrying it! 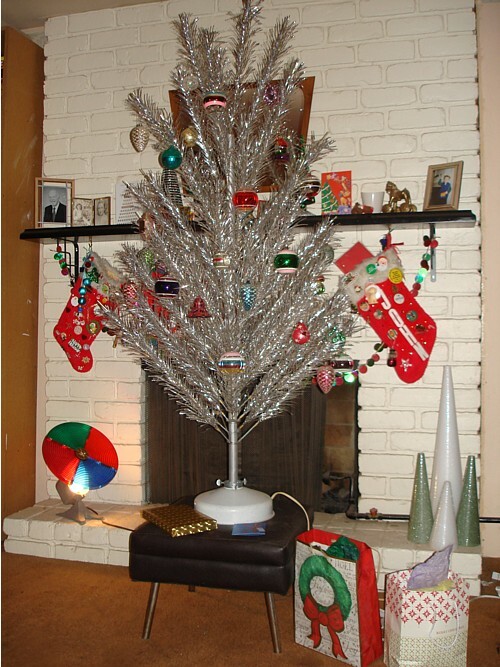 Back home at last, I had just a few hours to set up the vintage aluminum Christmas tree before heading out to pick up Kevin for the "Midnight" Mass, which actually starts with Christmas Carols at 10 PM. I got to be crucifer (carry the cross), and we went all out with little flourishes in our part of the ritual. Once I dropped Kevin off at his home, I was well and truly ready to be home myself. As John worked on moving boxes and hunting unsuccessfully for our Christmas CDs, I put ornaments on the tree as we watched A Christmas Story on cable. After John went to bed, I did my meager wrapping and stocking stuffing, photo editing and some laundry. 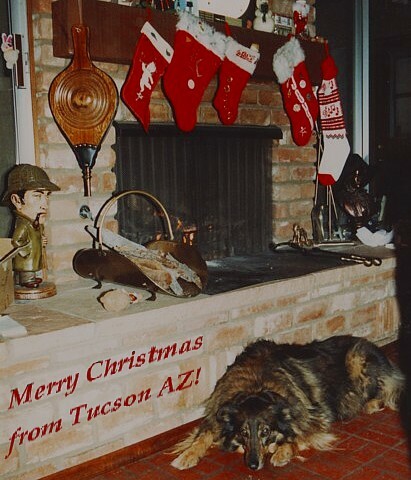 I also sent my dad and brother their Amazon gift certificates, this year accompanied by a new e-greeting service that allowed me to incorporate my own photos. Now I've got a shot at about three and a half hours of sleep before going to Mass one more time, at 10:15 AM, to help out and to see another friend. holiday joy from taking S. to the cat shelter on Yule, from taking Eva to the Family Mass, and kneeling before the creche, leaky oil candle in hand, during the Eucharistic Prayer at the late night High Mass, and listening to period carols played on a lute during communion. 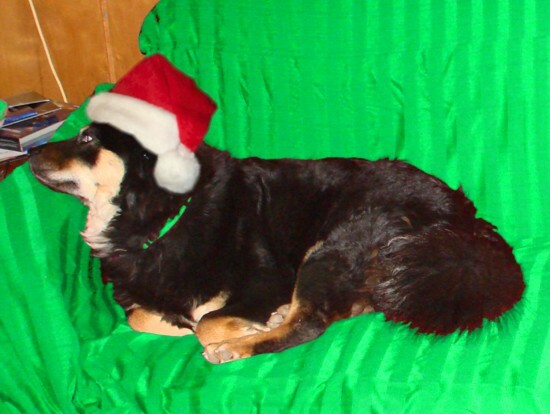 And you folks online have been outstanding with you holiday greetings! I'll try to reciprocate before Christmas Day is over. All these experiences are far more important than how many presents I was able to buy, much less how many books and other media I can knock off my Amazon wish list. 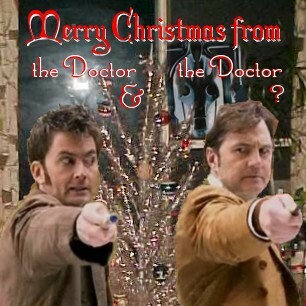 Merry Christmas to all, and to all a good night - although I expect some of you are waking up to morning already. Happy Holidays, folks! Running Around on Christmas Eve's Eve. Christmas Eve's Eve. That's what I used to call it, all those years ago as a child in Manlius. Still call it that, really. 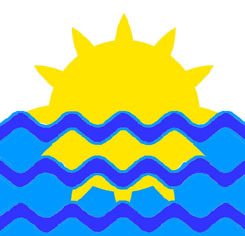 A 2007 greeting, based on a 1987 photo. It was hard to get up early on 2 hours of sleep and drop the car off, but I managed it. 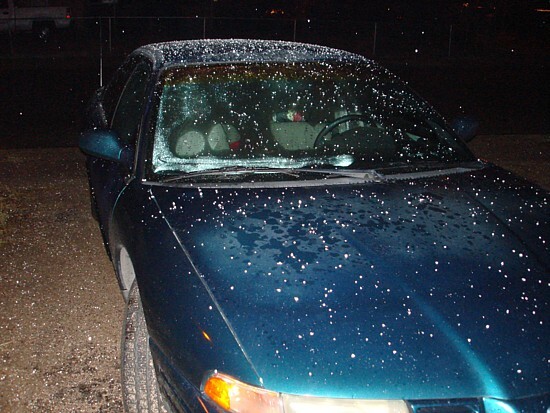 I had left two of the windows down to air out any possible cat dander, and of course it rained, soaking the seat and two paperback books; but they dried out with minimal damage. Half a block from my goal, the driver's side window (which wasn't down overnight) opened itself all the way and refused to go up again. So I had to get the window motor replaced as well as the front and rear brakes and, it turned out, the front rotors and two drive belts. The total, $641.17. Could have been worse! This does not, of course, fix the completely nonfunctional car radio. Tonight the driver's side internal door handle, which has been half-broken for years, boke a little more, and I was briefly unable to close the driver's side door from outside the car. But I was able to close it from witin, which seems to have sort of fixed it for now. One of my recruiters called about a temp to hire position. It pays well, but it's a 45 minute commute in the opposite direction from John's commute. The benefits are great, but not until six months from my start date, if any. I was asked to keep Tuesday and Wednesday free for a possible interview. What, on Christmas Eve, and Christmas Eve's Eve? I muttered something about unfinished Christmas shopping but agreed anyway - and heard not a peep of follow-up for the rest of the day. This morning my cell phone was inexplicably flashing the LG Rumor logo, and could not be turned on or off or used in any way. So I plugged it in to charge, just in case that helped. Later in the day it was working again, and had two voicemails. One was the original message from my friend that her cat had died, which I didn't want to listen to because it was so sad. The second, from Monday evening, was my friend telling me that her new cat was the right cat, that it sits on her lap and follows her around. S. sounded much happier, and I was nearly in tears to hear it! I've officially bought a few presents at last. 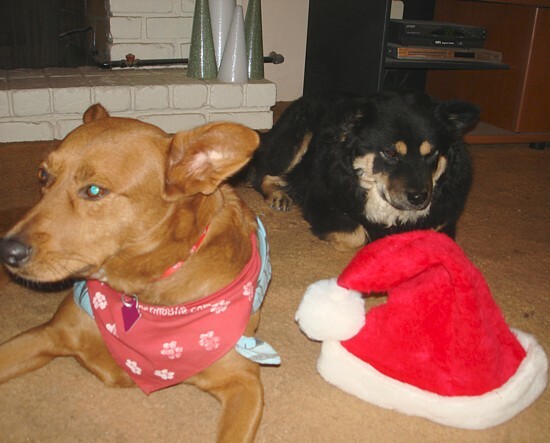 My dad's Christmas check came, and I was able to talk John into buying a new iPod (his old one has been giving him trouble for years) and get treats for the dogs' stockings before rushing off on my own. We hit two stores looking for Pfferneuse and cranberry relish, and didn't find them, and all the while I worried that I'd left the gas burner on under the remains of the chicken soup. I hadn't. Now I just have to get the aforementioned cookies and cranberries, if possible, plus stocking stuffers for John and maybe more stuffers for the dogs, and do the online gift thing for family. Well, let's see. We need to put up the tree, and I need to finish my shopping, and I may possibly have a job interview. I'm taking Eva to the 5 PM Family Mass, and Kevin to the 10 PM Hugh Mass with Carols. 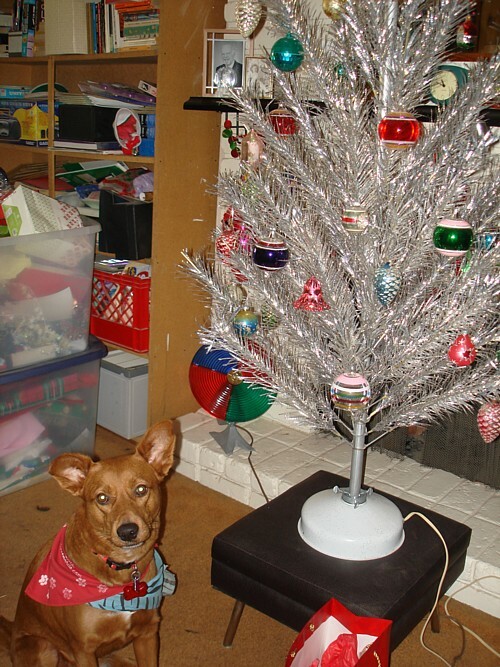 There's also the dogs' stockings to be decorated, and political buttons to make for a special order or two. Busy day, so I'd better get to bed so I can get up again and get started on it. 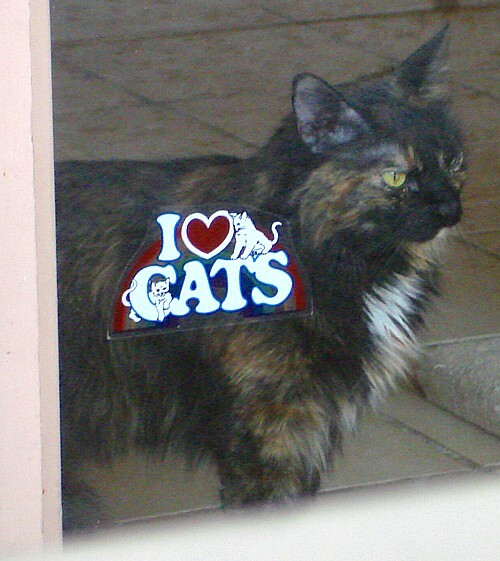 Here's a rare feline-centric entry from this lifelong dog person. If you are a regular reader of this blog, then you know that I'm very allergic to cats, which tends to dampen my enthusiasm for them. The truth is, I deliberately keep my distance, emotionally as well as physically. This made today's situation a little awkward, but not unworkable. I actually do like cats, even if I can't be around them myself. So when my friend S. called me yesterday to say that her cat had unexpectedly died in her arms, I was determined to help her find a new feline friend. I've written about S. before, but I always try to be vague on her details for the sake of her privacy. I will tell you this much: she is divorced, disabled, often depressed and fairly destitute. If ever there was someone who needed a pet, it is she. So off we went today to the Hermitage Cat Shelter near my home. 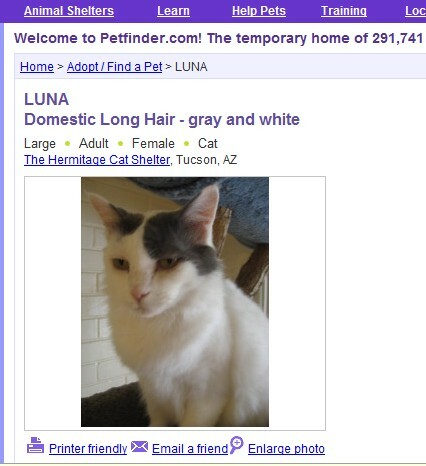 This is an almost-legendary, highly respected no-kill shelter in Tucson. S. was a little concerned about whether she was ready to replace a cat who had only died the day before, and I'm afraid I was a bit pushy about it. I had already driven across town to pick her up, and was concerned I would not be available to help her on some undefined later date. More important, I was convinced that she needed a cat right away, to help her get through the upcoming holiday without her [expletive] son. This paragon of filial duty has given his mother the bare minimum in attention or affection for years and years, and for the last year or so has professed to believe some outrageous slander about his mother as an excuse to abandon her entirely. If he really believes it, then he doesn't know her at all. Either way, it leaves his mother pretty much alone in the world. She needs a loyal companion, and in her apartment that means a cat. The Hermitage is on the discontinuous 21st Street in Tucson. We drove around for half an hour before I broke down and stopped at the house to check the exact address and location on an online map. When we got there I walked in for about a minute, just long enough to explain S.'s situation while she used a restroom. 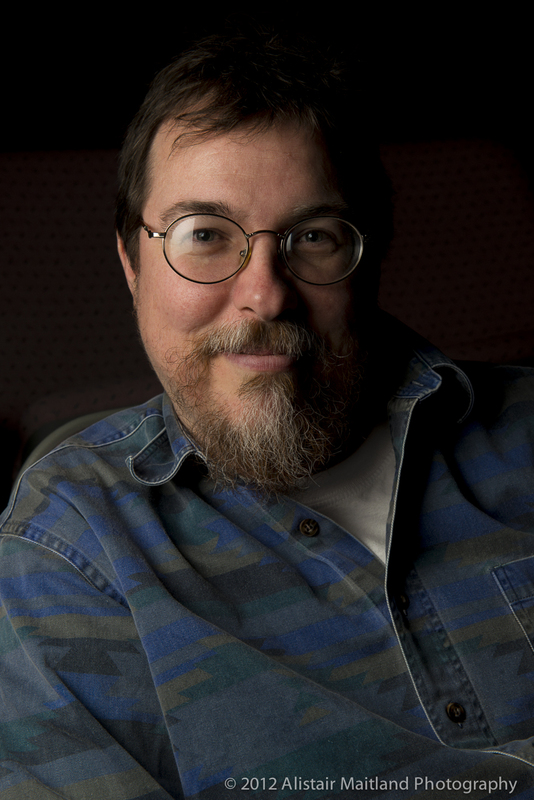 Then I sat outside at a table for about an hour, ostensibly readying The Lost Road by J.R.R. Tolkien. It was interesting. I wandered around a little, taking pictures of the grounds and of their front room through the glass. People were coming and going, donating pet food and rummage sale items, doing cleaning and maintenance and visiting the cats. One couple left without a cat after concerns were expressed about spreading disease between the semi-feral "outdoor" cats they had adopted and a new indoor one. Another couple dropped off a box of moist cat food and several huge bags of dry food and kitty litter. They explained that they were making the rounds of their favorite charities, making donations in lieu of Christmas presents. The owner of ten cats, the man found it a little difficult to leave without adopting another one. I knew the feeling. 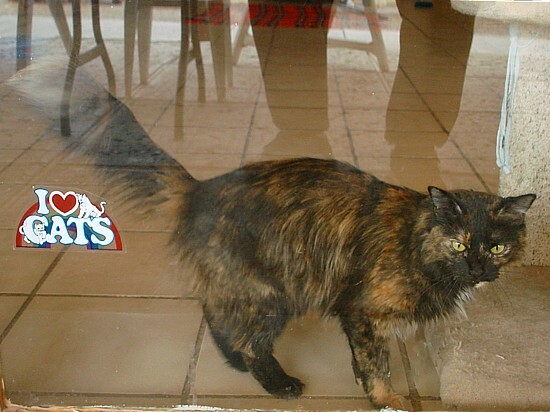 I had been rather enchanted by a calico cat, among others, that I was watching through the plate glass front window-wall. 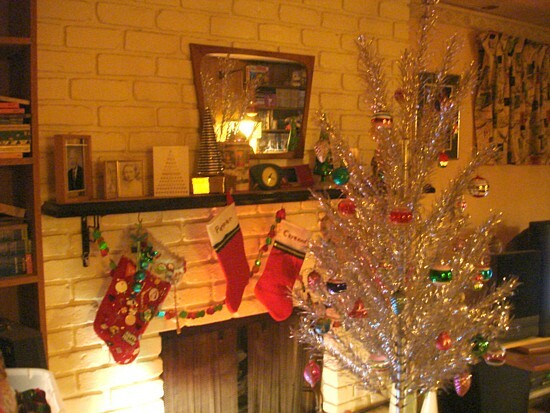 The place was the embodiment of love, goodwill and common purpose, the very spirit of the season. 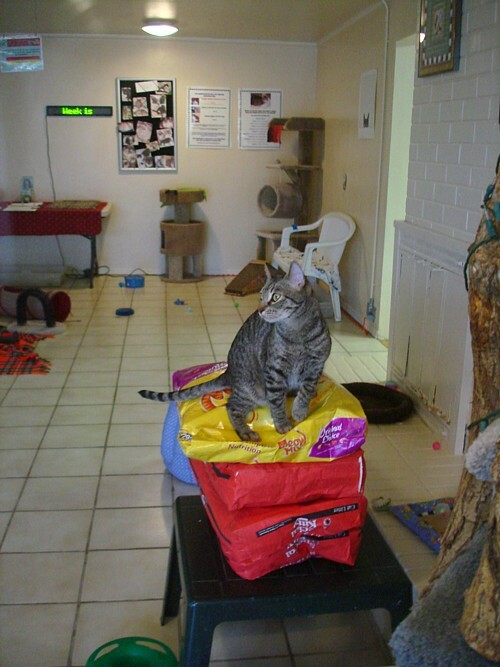 It was evident that the shelter needed additional funds, mostly for a coat of paint here and there, but it was also obvious that the cats themselves were receiving exemplary love and care while awaiting their "forever homes." Eventually I was told that S. had found the right cat and was doing the paperwork. 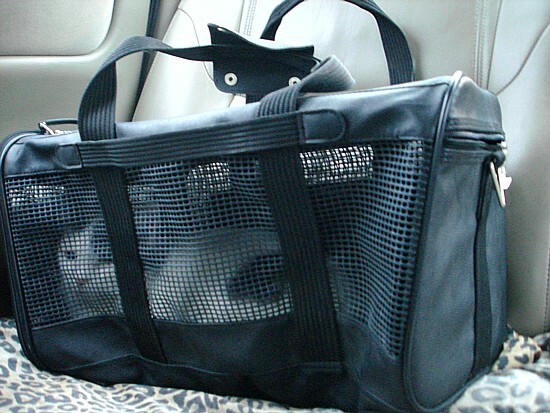 She emerged about 15 minutes later with a white cat with grey spots in her flexible carrier. The cat, Luna, was the same one the couple with the outdoor cats had been talked out of adopting. S. told me that the volunteers said she was their favorite cat in the entire shelter. They had also given S. a discount as a disabled adopter. I drove S. home with her new friend, and I've left my car windows open overnight in hopes of avoiding asthma next time I drive the car any distance. I have a tickle in my lungs right now. I never really got a good picture of her, so here instead is part of a screen shot from Luna's Petfinder listing, before it goes away. I just hope I was right about the timing, and that S. and Luna will benefit from each other's company, in the short and long term. One thing for sure, this was the highlight of Christmas for me. Update: I spoke to my friend on Christmas evening, and she said that Luna has turned out to be the "perfect cat" for her, following her around, sitting in her lap and giving her "cat kisses." Hooray! 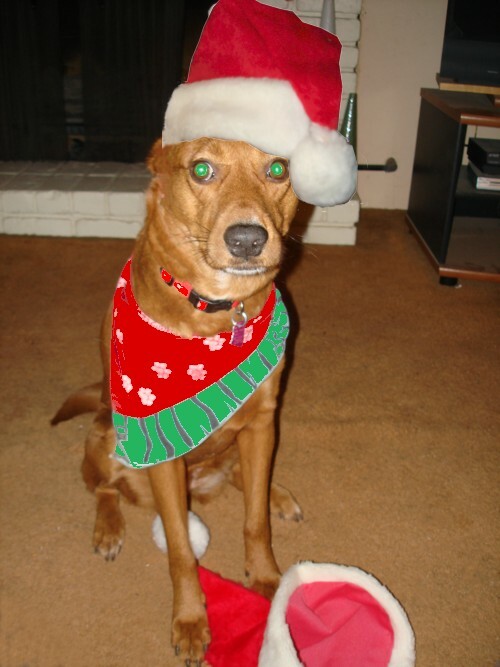 For Ellipsis Monday Photo Shoot #17, Carly wants us to design our own Holiday Greetings. Here's a first pass at this - I will almost certainly come up with a few more over the next couple of days. 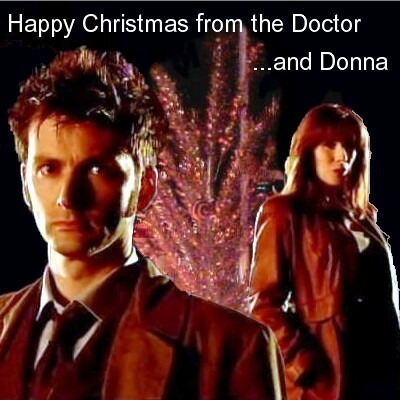 Adapted from a scene in the Christmas special "The Next Doctor." Tomorrow night I'll show you some past efforts, but for now I've got to go to bed. In less then seven hours I'm picking up a friend whose cat just died. I'm hoping to connect her with a new cat this afternoon. 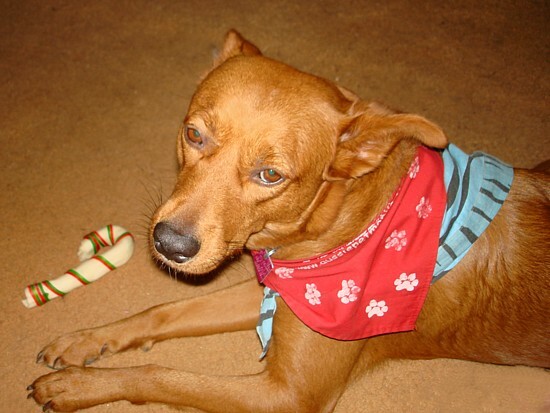 The tricky part: with my allergies, there's no way I can even walk into the no-kill shelter with her. Be sure to check Ellipsis every Monday for the week's shoot, and for links to the entries of the previous week's participants. 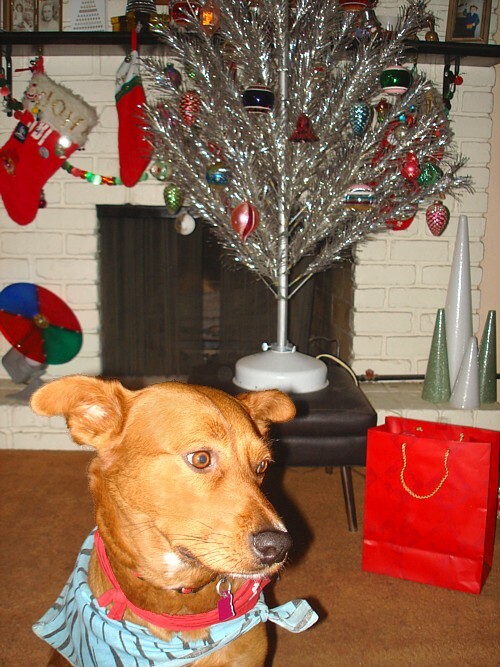 Weekend Assignment #247: Home for the Holidays? 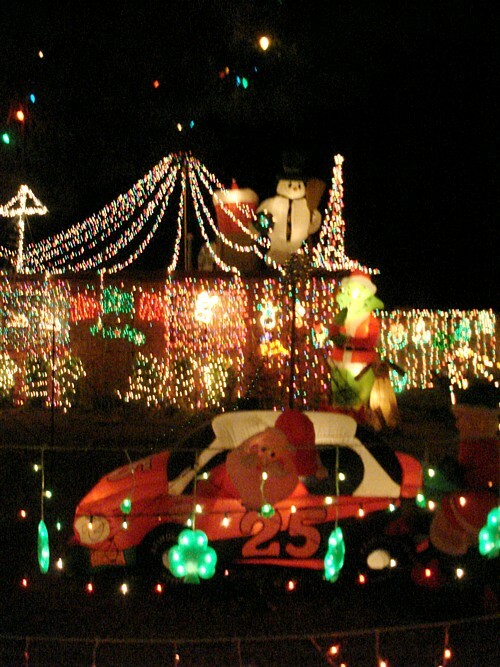 How Do I Know It's Christmas?